Margaret (?) married Henderson Houghton. James Houghton married Gillian Langford. John Houghton married Ida (?) in circa 1896 mar 4 years in 1900 census. Ida (?) married John Houghton in circa 1896 mar 4 years in 1900 census. 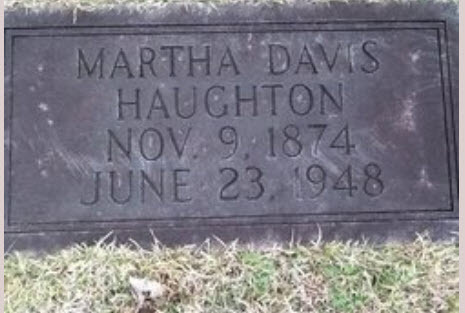 Martha Matilda Davis married Gayle Haughton Sr, son of Lemuel Burkett Haughton and Peterella Smith Gayle, in Dec 15, 1897 at Dora, Walker Co., AL, USA. Patrick Henry Haughton married Anna M. (?) in circa 1875 mar 25 years in 1900 census. Anna M. (?) married Patrick Henry Haughton, son of Richard Haughton and Mary Sylvia Haughton, in circa 1875 mar 25 years in 1900 census. Will Houghton married Rosy (?) in circa 1900 mar 0 years in 1900 census. Rosy (?) married Will Houghton in circa 1900 mar 0 years in 1900 census.